To err is human – unfortunately. That is why we have to live with this weakness and the more or less fateful results. But it gets even worse: this ailment can fall upon large groups of people. This was demonstrated quite impressively in 2005: Even during pouring rain they ventured to the “Irr-Land” in large groups to visit a 2.5 km path winding through an 8 acre cornmaze. 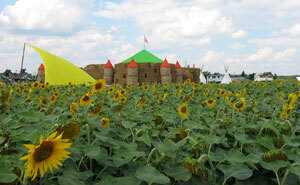 A sunflower labyrinth could also be found. To guarantee that the visitors didn’t miss a path, rubber-stamp stations and quizzes were set up even in the most remote corners of the maze. You could hear chattering and giggling in between the man-hight plants – demonstrating how much fun was being had: Exloring the feeling of getting lost without actually losing your way. The cornmaze attracted a lot of guests who happily made the way to Neu Boston, about 1h outside of Berlin and only 15min away from the Storkow/Mark train station. 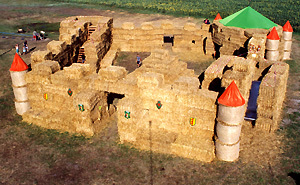 The creators of the maze had been inspired by the previoulsy barren area in the Oder-Spree-Lakearea. They were already known for their creative ideas that inspired their guests to take part in the fun and be creative themselves. 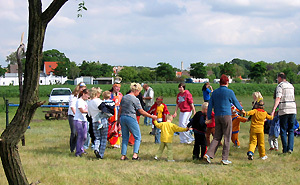 The endevours of the charitable LOLLYPOP group included Bathtube-Regattas, Soap-Box derbies and box-climbing – a breath of fresh air among childrens’ events that gained them a large fanfollowing. 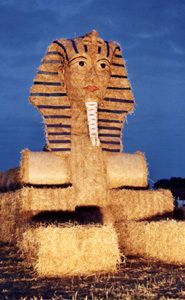 1999 the LOLLYs decided it was about time to spin straw to gold and organized a festival all about straw together with the Storkw Toursist Bureau. 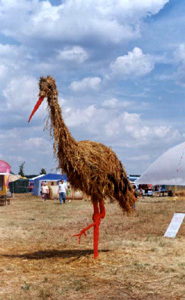 Straw existed plenty in Brandenburg and in this park it was more than just animal feed and bedding: It came to life in the form of dolls, animals and other creatures and objects. This included a straw castle which broke a record during Brandenburgs 1st Strawfestival and landed the straw artists from LOLLYPOP a place in the Guiness Book of Records. 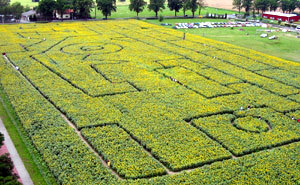 The event progressed from straw sculptures to corn fields and sunflowers in shape of large mazes and the location – just bursting with creative potential – got its name: IRRLANDIA , der MitMachPark. Very fitting, considering that “irren/verirren” means getting lost, perfect for a park created around mazes and labyrinths. Bit by bit the park grew, one large or small attraction after another – bouncing castles, viking swings, roll-slides, waterparks, intricate marble-mazes, gold-washing stations, giant soap bubbles to just name a few. This was made possible – and still is – by quite a few creative minds in Storkow and friends of LOLLYPOP who never ceased to support this park in its growth with their fun and generosity.